This is not the same feeling I got when I started Nick Fury, Agent of S.H.I.E.L.D. : Empyre. When I had bought the book, I was excited because I’m a fan of Nick Fury. 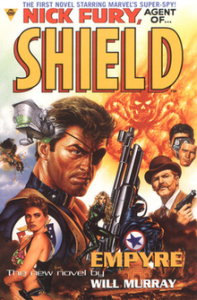 In my research (or more aptly, quest) to add superhero novels to my collection, I was surprised to find there was a Nick Fury novel out there. Of course, I snatched it up. The cover is awesome and what would you expect from comic artist great Joe Jusko who has done such things as Spider-Man, Black Panther, and Conan the Barbarian. It was a great look to the book so I was excited to dig in. When I started the book, I got the feeling that Will Murray really didn’t know too much about the character. There was a hokey kind of Golden Age writing of the character. That would have been fine back in the 1930s. But the book was written in 1999 (the copyright is 2000). So that kind of disconnect from the character was disappointing. It felt too comicy (me and my made up words). Don’t get me wrong. I love my comicy comics. But this is a prose novel. This is a different monster. There should have been some more in terms of character development and it appears as if Mr. Murray just does a cut and paste on the character approach. Add to this the inordinate amount of time spent on a secondary character who had nothing to do with the mainstay cast of S.H.I.E.L.D. operatives, and you begin to wonder what this novel was really about. Don’t let the title fool you. Nick Fury doesn’t show up as a major player in the book until over halfway through it. The majority of that time is spent on Starla Spacek of Psy-Ops. Dum Dum Dugan shows up a bit but others like Gabriel Jones who gets an honorable mention at best. Jasper Sitwell, Clay Quartermain, and Sharon Carter are nowhere to be found, and Contessa Valentina Allegra de la Fontaine gets a passing mention. Then, when you look at the back of the book and find out a little about the author, it all makes sense. Mr. Murray is a self-proclaimed psychic. That information makes it seem rather clear that Spacek was a character that he lived through vicariously to promote his worldview agenda on psychics, not to tell a story about Nick Fury and S.H.I.E.L.D., at least for the first 50%+ of the book. After that, it seems like he remembered why the novel should have been written. The writing in many places is disjointed and the villain is one dimensional. Plus, there are devices that are just plain ludicrous which smacks of lazy writing. For example, there’s one part in the book where Fury and Spacek are incarcerated by the main villain. There’s no way out. Then, Fury takes off his eye-patch, attaches it to the barred window, then spits at it from across the room. And what do you know, the window blows up after a perfect spit job. You see, the explosive eye-patch is activated by moisture. There was no set up earlier in the story for that small but very important detail. 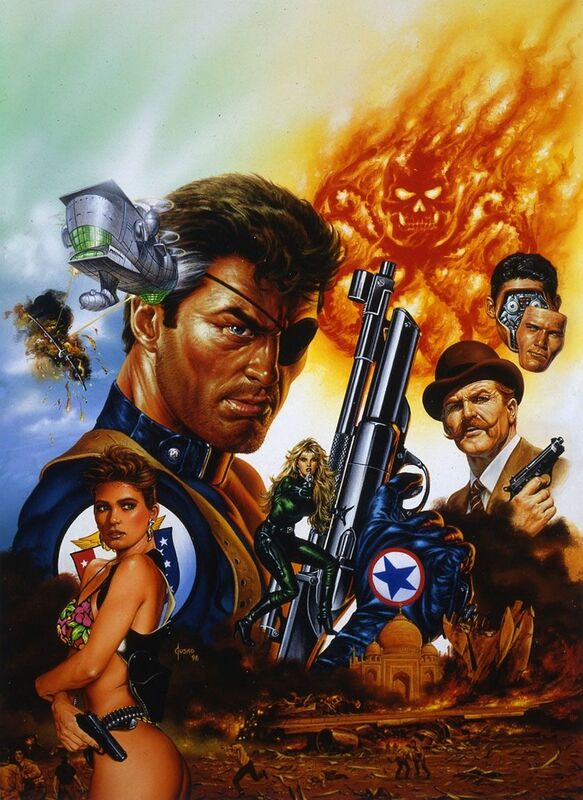 No hint that Nick Fury had suddenly become a spitting sharpshooter. Just atrocious, slothful writing. I suffered through the rest of the story to the end and I’ll keep the book to round out my superhero prose novel collection. But there is no way I would ever recommend reading this book. It shows a woeful disregard of the Marvel Universe. The story is a conflagration of half-baked fragments that have been slapped together to present the author’s bias on psychic phenomena. By all means, use your writing for that because like I’ve mentioned before, every writer is a preacher. But if you’re going to do it, do it with an actual story and do it with decent writing. This gets a D on my personal grading scale.